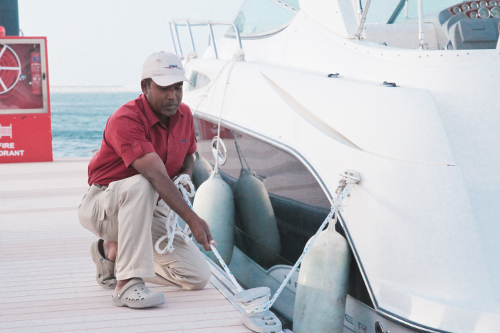 The first marina launched as part of Doha's prestigious Lusail City development will become a flagship yachting destination and the premier marina facility in the Middle East. Located in the Marina District and designed to accommodate 8 to 40 metre boats across 142 spacious berths, Mourjan Marinas - Lusail City is supported by state-of-the-art eco-friendly facilities including contemporary shade structures with cooling, in-built misting, a trio of multi-purpose lounges, WiFi, a resident concierge service and 24-hour dock master assistance. Located only 15 minutes from Doha International airport and adjacent to the Four Seasons Hotel the marina features 112 berths for yachts up to 35 metres and will be part of the new Nobu restaurant development. Boaters enjoy easy access to the Doha Corniche and members can take advantage of a membership to the Four Seasons Hotel facilities. The marina also offers a boat ramp, round the clock security, dockmaster assistance, along with seven-day per week fuel service for both diesel and petrol. Located within Al Mouj, Muscat development at the heart of Al Marsa Village, Almouj Marina is a premier marina facility and flagship yachting destination accommodating yachts from 10 to 40 metres. Boaters can take advantage of the close proximity to Almeria North, which features a choice of cafés and restaurants, a supermarket and other retail outlets. Ideal for sailing enthusiasts, the marina is home to Oman Sail and provides an ideal venue for sporting events, creating a social hub for the local community of Oman and The Wave, Muscat's residents.